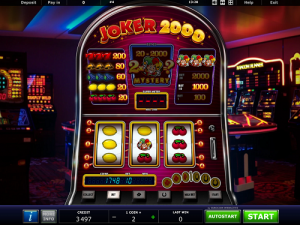 Joker 2000 is a slot game from Novomatic. Despite the name, Joker 2000 doesn’t look like a game from the year 2000! Instead it looks like a game from 1985. This slot doesn’t look like any other online slot game. Normally, with online slots, all you’ll be able to see are the reels. However, Joker 2000 is an online slot that looks like an actual slot machine! Although you won’t believe you’re playing on a real machine, it definitely gives you a real casino vibe. Even the background adds to the atmosphere as you can see that the Joker 2000 machine is standing in a real casino. Behind Joker 2000, you can see other Novomatic slot machines, such as: Simply Wild and Random Runner. This game is actually quite new but it is all about retro tradition. The most important symbol in the game is the Joker and he’s as jolly as ever. He’s wearing a red and green Jester costume with golden bells! Jesters have been loved for their jokes since medieval times – when they used to be employed by the King or Queen to entertain! Now they appear on casino games and in packs of cards! Fruit symbols, golden bells and red sevens also appear on the reels of Joker 2000. Flashing lights, colourful symbols and exciting sounds all come together to create an awesome, vintage slot vibe! Novomatic do make a few similar slots, such as: Gold Runner, Simply Wild, Cash 300 Casino and Golden X Casino. This Novomatic slot game is a very simplistic one indeed! There are only three reels in this game and five paylines. Paylines 1, 2 and 3 are horizontal and run across the reels on the middle, top and bottom positions. Paylines 4 and 5 are diagonal and run from the top position to the bottom position and vice versa. All Paylines pay from left to right. The reels are covered in bright, colourful and recognisable slot symbols! There are only 6 symbols in Joker 2000 which is quite a small number of symbols for a slot machine. On these jokerific reels, you’ll find: cherries, lemons, grapes, golden bells, red sevens and the jolly joker! When you spin the reels and land matching symbols on paylines, you’ll get payouts! 3 cherries pay 20 coins. 3 lemons pay 20 coins, too. 3 grapes pay 60 coins. 3 golden bells pay 80 coins. 3 red sevens pay 200 coins. After you pay in money, you can decide the value of the coins. The joker is the highest-paying out of all the Joker 2000 symbols! 3x jokers can pay 100 coins (with a 5 coin bet); 1000 coins (with a 10 coin bet) and 2000 coins (with a 20 coin bet). When you match up symbols across one or more paylines, and you get a payout in coins, there are a few things you can do! If you’re a straightforward player who just likes to keep things simple, you can collect your win and transfer it to your balance. If you’re a player who like a bit of an extra risk, you can gamble your wins! When you choose to gamble them, the gamble symbols will be lit up and these are found at the bottom-right of the slot machine. There are red clovers and black horseshoe symbols and you need to choose between red and black! If you choose red and it’s black, you’ll lose your win. If you choose red and it’s red, you’ll double your win! When you get it right and double your win, you’ll be able to have another go at the game – and you can keep going until either you get it wrong or you’re happy with the size of the win and you choose to collect it. Another thing you can do with your wins in Joker 2000 is transfer the coins you won to your supermeter. You can then play the game with the coins in the supermeter. When you play in supermeter mode, you have the chance to get mystery wins! 2x joker symbols in this mode can pay anywhere between 2 and 2000 coins!